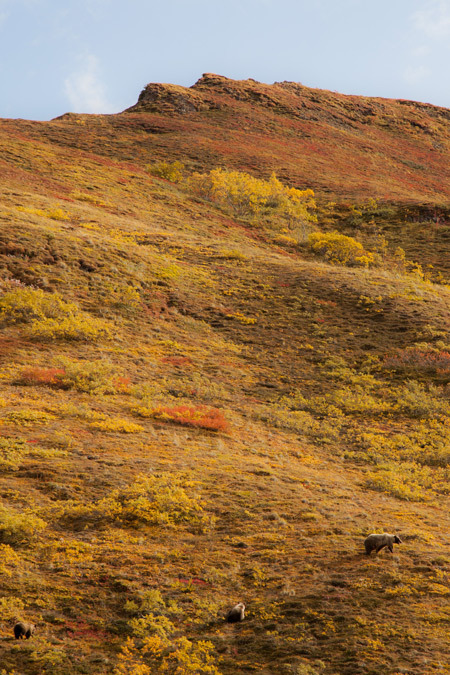 Sometime between late August and early October, Fall settles into Denali National Park, and much of the vegetation transforms from a lush green into a mix of deep amber, red, and orange hues. While Fall lasts three months on the calendar, in Alaska the season reveals itself as a quick two to three week transition between Summer and Winter. Summer crowds in Denali are typically light compared to other national parks, especially past mile 14. During the final few weeks of the season, crowds are often even lighter. 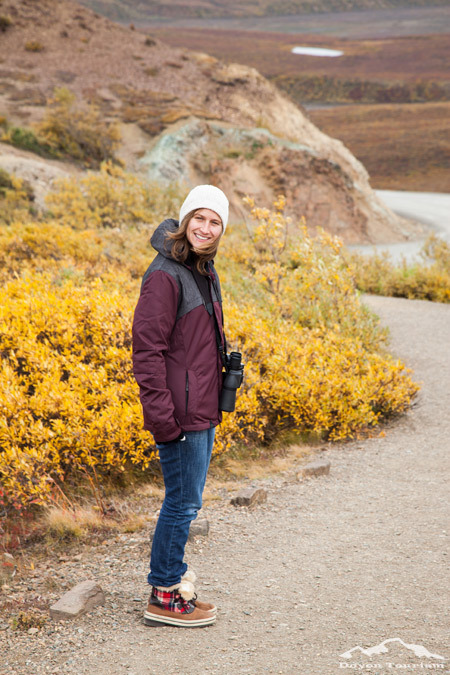 Since many lodges and tours in and around Denali close up in mid-September, the natural look of the park can feel even more unoccupied and exclusive. Many of Denali’s most iconic photo spots change into bold and bright landscapes of golden hills often back dropped by layers of blue sky and dramatic white and gray clouds. 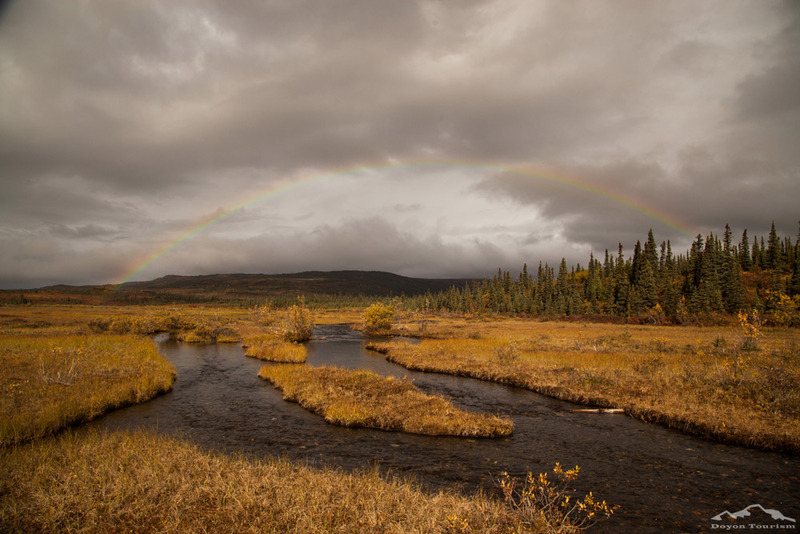 If you’re fortunate enough to see rain during a partly sunny day in Denali, rainbows may even make an appearance to add even more color to the picturesque views. In the final weeks before winter, animals in the park are foraging for food, stocking up on energy before they hibernate or migrate for the season. 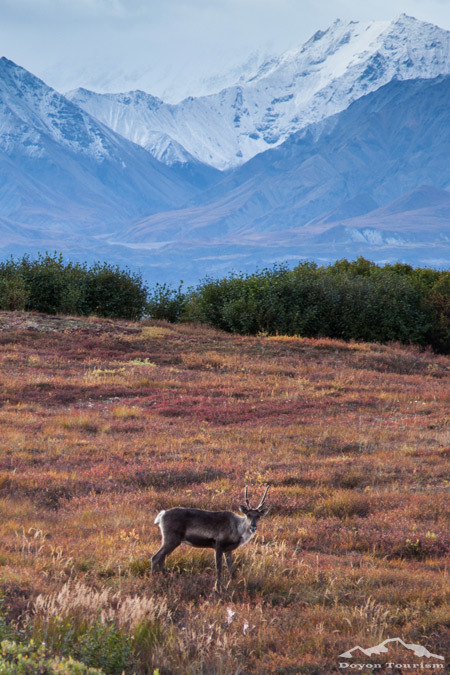 Since Denali Park sits in the rain shadow of the Alaska Range, the park tends to receive less snow than other parts of Alaska, and many animals and wildlife like to make it their home during the winter. 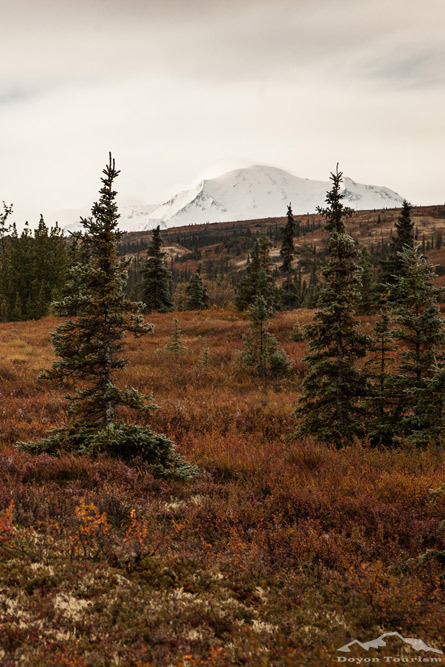 Sometimes snow starts to cover the landscape in late August before the busses stop touring through Denali. Other years, snow doesn’t show up until October, after most visitors and staff have left. 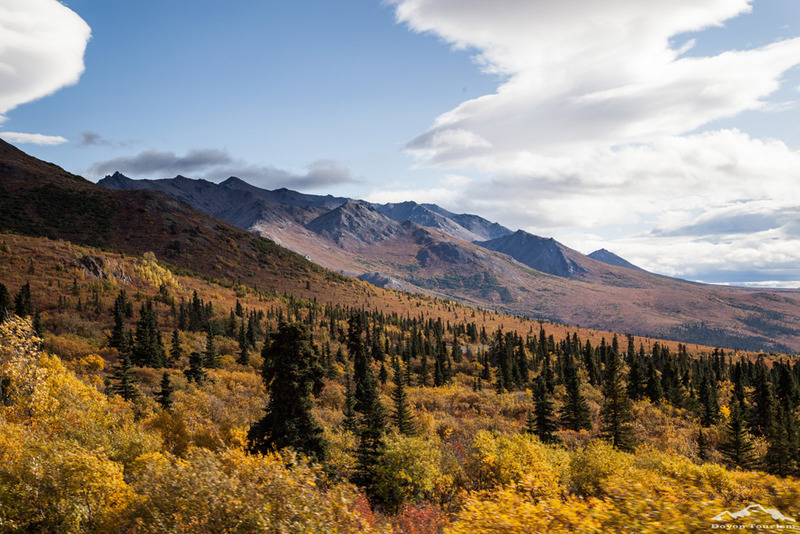 The wilderness of Alaska is always changing with the seasons, and Fall just happens to be a brief period when those changes show up in bright yellow colors. Alaska is beautiful. We’ve been up there in spring, summer , fall. Summer in Fairbanks is my favorite. Would love to go back one day as we have family there.